Go beyond iTunes and play most any media format including as MKV, AVI, MP4, WMV & many others. Silky-smooth HW decode playback for 1080p content, with integrated Dolby® Digital Plus surround sound. Visit your favorite sites, stream HTML5 video, and update Twitter or Facebook all on your TV. Your couch is your new workspace. Install 3rd party apps such as Kodi (XBMC), YouTube, nitoTV, Rowmote, and more. Keep tabs on all your media with custom playlists, and loop or shuffle them as you please. Use the Apple TV as a flexible, low-cost advertising/display solution. Includes auto-start and reload options. Enjoy faster network transfers with integrated network bandwidth and speed tuning. 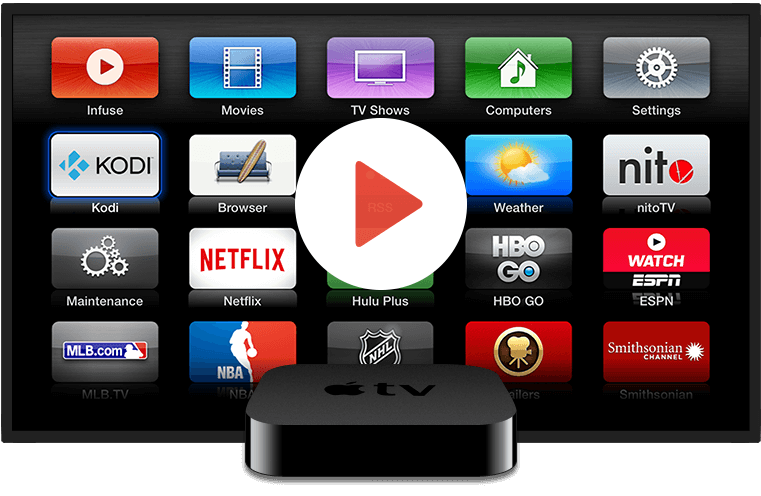 Updates are easily installed with just a few clicks through the native Apple TV menus. Keep all settings and data safe with one-click backups saved in the secure Amazon S3 cloud. Access a number of advanced developer features through nitoTV. Entirely optional and only for the brave at heart! Why mess with what works? The normal Apple TV features will remain intact and unchanged.